A GATHERING OF THE 7-Cs: The Women and Leadership Alliance's most recent workshop brought together students from across The Claremont Colleges. When the Board of Trustees voted 40 years ago, on April 24, 1975, to turn CMC into a coeducational institution, historian Kevin Starr writes in his history of the college that the vote marked a major milestone in CMC's first 50 years. 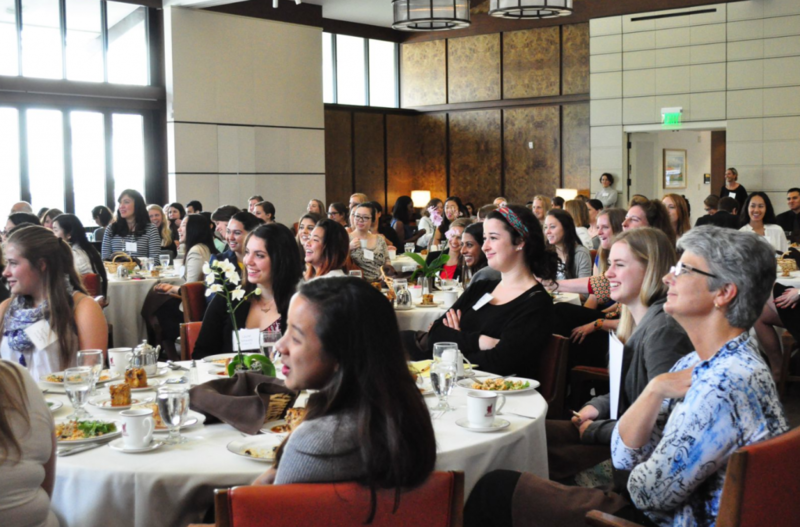 Today, the opportunities for growth and enrichment for female students at CMC -- and The Claremont Colleges, in general -- is regularly addressed by the Women and Leadership Alliance, which gives special attention to issues touching on women's leadership in business and the professions. This spring the WLA held its sixth annual conference, featuring a keynote address by poet and spoken word artist Azure Antoinette (pictured left), who urged an Athenaeum audience of 7-C students, staff, faculty, alumnae, and friends of the colleges to create their own opportunities, rather than wait for them. The day-long program also featured a workshop bringing together more than 25 successful women leaders representing entrepreneurship, entertainment, education, public service, consulting, finance, health services, and marketing back to campus. The workshop was organized in collaboration between the Kravis Leadership Institute, the Robert Day School of Economics and Finance, and the Berger Institute for Work, Family and Children. More than 90 students from across the 7-Cs enjoyed listening to Antoinette, who is CEO, Poet, and Millennial Advocate focused on Creativity, Courage and Using Voice to Initiate Action. The keynote presentation offered an inspiring introduction to the half-day workshop, which incorporated honest and open dialogue between students and female leaders in attendance. Throughout the afternoon, attendees participated in an informal roundtable discussion with table leaders split by industry, allowing students to ask questions focused on specific career and post-graduation experiences as well as on engaging one’s passions inside and outside the workplace. All participants were extremely receptive to the advice and open conversation, remarking that they enjoyed the opportunity to ask questions not heard in “typical” networking situations.